There were some requests from readers to provide a compiled binary for windows of the latest cgminer 3.7.2 with Gridseed support based on the jmordica fork, so we have compiled it. The most notable difference from the previous compiled version of cgminer we have posted with support for the G-Blades (also present here) is the addition of support for NiceHash service where you can now also use your Gridseed ASICs to sell your hashrate. The supported frequencies range from 700 to 1400 with finer grain selection available, for the complete list of supported frequencies you can check the readme file. Below you can download the windows binary, you can change options by editing the config file. 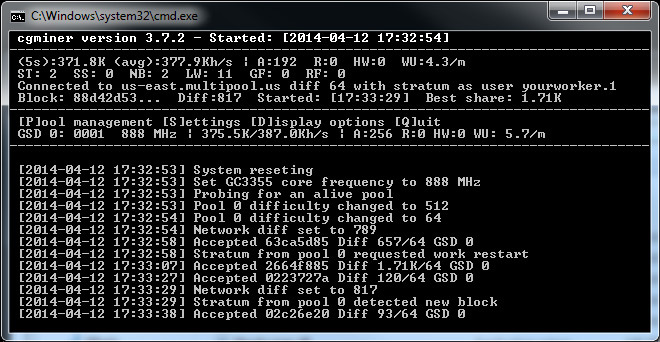 We have updated our windows build of the cgminer 3.7.2 with support for Gridseed 5-chip GC3355 ASICs to properly support the new 80-chip Gridseed G-Blade miners, this release is based on the (girnyau source) with the fix for more than 8 chips (up to 256) from dbartle’s version. Previous releases did not properly reported the local hashrate of the new Gridseed G-Blade miners that consist of two 40-chip PCBs, though they were working just fine with the hardware and poolside everything was Ok. Now if you set the chips value from 5 to 40 in the BAT file for running the cgminer you should be seeing the correct local hashrate for the G-Blade, it should work just fine though we haven’t been able to test it as we do not yet have a G-Blade in our hands. Other than that the updated version is compiled and packaged with the latest OpenSSL libraries with a fix for the the Heartbleed bug. You can download the windows binary below and the source folder contains the files modified from the original source should you want to compile it yourself. Check the Readme file for more information on the list of supported frequencies and how to set individual frequencies per device for overclocking your Gridseed ASIC miners. 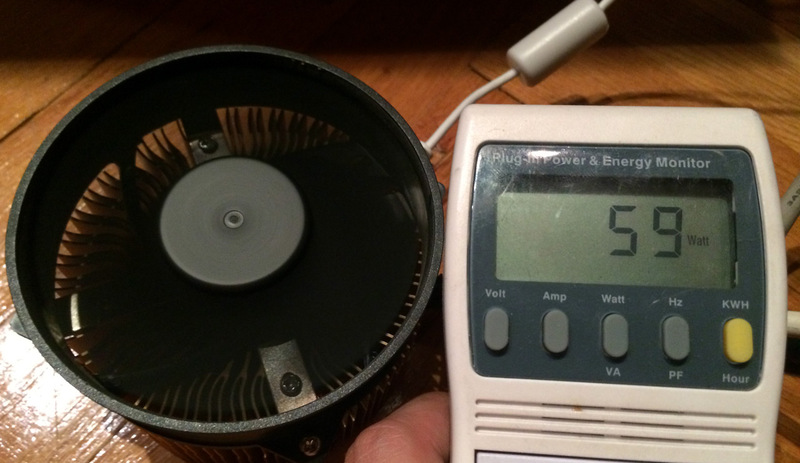 The last time we talked about voltmodding the 5-chip Gridseed ASIC devices we did what we considered the optimal voltmod for optimal performance/power consumption. Back then we discussed what could be the theoretical maximum you might be able to push the voltmod to in order to try to get the best possible overclock, though that would be achieved with an unreasonably high power usage. Well, we have decided to try out and push things to the maximum, namely replacing the R52 resistor with a 68 kOhm 402 1% SMD resistor. With this modification we were aiming to get 1400 MHz while still fitting in the power consumption that the ASIC could handle in Dual Mining mode or about 60W, however running in Scrypt only mode. With these settings we were planning to get stable around 600 KHS if we would succeed in actually running the GC3355 chips at a bit over 2 volts. So we’ve replaced the R52 with a 68 kOhm resistor, assembled everything up (do not try to run the ASIC disassembled with this mod as you can burn the voltage regulators in a matter of a few seconds). Firing up the ASIC has shown a total power usage of about 58-61W, so pretty much what we have planned initially, however the problem was that the Gridseed device did not want to function properly at that voltage after the modification. It simply did not send any shares back to the server, neither it was showing any HW errors, through apparently the device was working and communicating with the miner software. so we do not recommend to push things so much trying to get the maximum performance regardless of the power usage, better stay at at the reasonable recommendation by using a 47 kOHm resistor which should get you close to 500 KHS at about 20W, running the miners stable at about 1150-1163 MHz. Even if we were able to get the device working properly with the 68 kOhm resistor mod and with 60W power usage it wouldn’t be reasonable to get just about 100 KHS more with an extra 40W of power. You could of course try resistors with values in between 47 and 68 kOhm to see where the maximum would be, but for us it is not reasonable to get just a few more extra KHS with double or triple the power used. Still feel free to experiment and report your finding and as usual be very careful not to burn your hardware while experimenting with it. 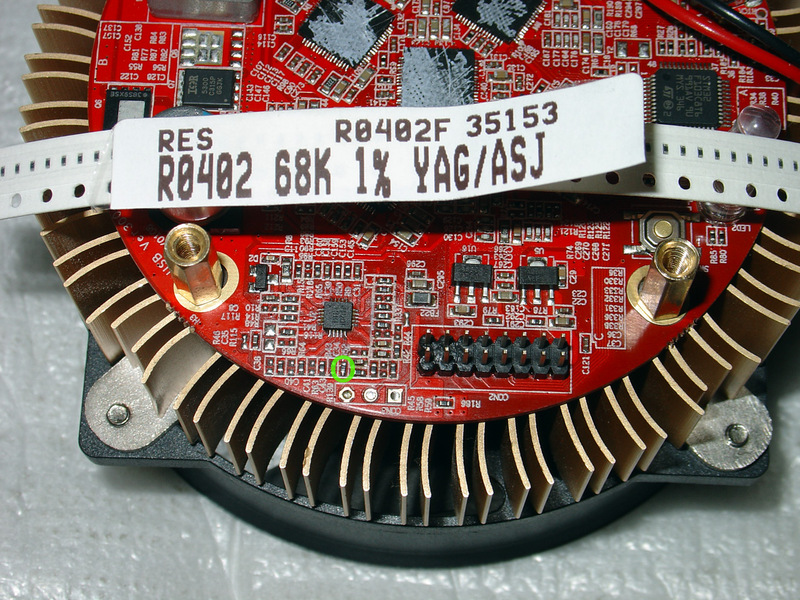 If you go with more than 47 kOhm resistor be extra careful if running the device with the bottom of the cooler not attached as you can easily burn the voltage regulators of the ASIC!